The Worship Board just opposite the school entrance offers pupils, staff and visitors a chance to reflect upon the values that we explore though Collective Worship within school. There are altars in both the small and large halls as a focus for our acts of Collective Worship. These themes will be linked to our school values of Faith, Harmony, Respect and Life Long Learning. Holy Trinity Primary School (“HTP”) is based upon embedding the school’s values of Respect, Harmony, Faith and Lifelong Learning at the heart of every child’s education whilst at the school. Since HTP was founded the school has been granted controlled status under the 1944 Education Act, which means our school is a Church of England School and so we seek to approach all aspects of our school life bearing in mind our Christian Foundation. HTP is a Rights Respecting School. The “School Council” are elected pupil representatives drawn from every class. After hustings and democratic voting the children act for one school year. The School Council worked with staff and governors to agree the values and ethos that are displayed within the school and respected by our school community. The Councillors ensure that these values are embedded in all the projects they undertake. Views from the children are gathered by the Councillors in class circle time discussions and through feedback boxes. The School Council has given feedback on what makes for a happy school environment. HTP ensures that the children and the wider school community understand that abuse and prejudice will not be tolerated, with clear information given out on issues such as safeguarding, racism, homophobia, bullying and e-safety. HTP is recognised as an inclusive environment where all children, including those with particular physical, emotional or educational needs have a voice that is heard. The high standards of behaviour found at HTP helps prepare our children for the expectations of secondary school. The school is dividing into four houses, (Andrew, Patrick, George, David,) each are filled equally with children from years Reception to Year 6. Children earn points for their house through a reward system which is linked to both the school’s values as well as to the Christian values embedded at the heart of our teaching. Children are encouraged to take on positions of responsibility within HTP, including becoming members of “School Council” and “Sports Captains”. House sports are both inclusive and competitive. “Sports Captains” champion an individual sport and are selected for their leadership skills and passion for their sport. Collective Worship supports the teaching of Christian values (including Open the Book) and are regularly led by members of the local clergy and members of the church community. Our children enjoy attending the “Easter Club” run during the holidays, and some of our children attend the “Brownie Pack” run at St Nicholas, which is again supported by Holy Trinity Church. “Playground Ambassadors” are chosen to help children who find playtimes challenging and will organise group games which are inclusive for all. KS2 children can undertake the role of “Office Angels”. Our “Office Angels” support our administrative staff in the school office and will help deliver messages, guide visitors and answer the telephones. The “Eco Group” help keep our school environment tidy with their litter picking duties and environmentally friendly by switching off lights and closing windows and doors. Our Year 6 pupils attend a Leavers Service either at Salisbury Cathedral or at our locally linked church, Holy Trinity Church. Parents and carers are invited to the termly Celebratory Worship which showcase the children’s work and achievements. Carol Services are held in the school garden and at Holy Trinity Church and are open both to the whole school and local communities. The Easter services are also held at Holy Trinity Church and are similarly well attended by all. The “Friends of HTP” organise popular Christmas and Summer Fayres which raise valuable funds for school resources. The Year 5 and 6 children organise an annual Apprentice Fair which gives them the opportunity to develop entrepreneurial skills. The School Council choose two charities for the school to support in each school year – one local and one national. This year Weldmar Hospice and the NSPCC are the chosen charities. The children are also keen supporters of Children in Need, and in 2015 HTP was ranked 67th nationally across all UK schools for raising funds. In 2017, the pupils raised of £1,710 with various fundraising initiatives that engaged the whole school community for Children in Need. The curriculum at HTP is broad and balanced, enabling all children to be successful and to move on to the next stage of education. All children study RE to develop their spiritual and cultural understanding along with exploring moral issues. Before each act of Collective Worship the children acknowledge the Lighting of the Candle and then put their thoughts after the Worship into their Reflection Diaries. Children are encouraged to take time to reflect on what is happening in the world around them and their role within it. They are given regular (daily) opportunities to reflect on their response to situations in their school, their locality and the wider world community. The school’s definition of Spirituality has been based on the three images: a window, a mirror and a door. The window prompts them to consider something that they have learnt, either through a Collective Worship session or through class discussion or a news broadcast. The mirror represents them taking the time to reflect on how they feel about what they have learnt, and the door prompts them to consider what they might do in response. PSHCE is also embedded in the school; this is through distinct lessons, off timetable events and activities and within some subjects’ schemes of work. Subject areas will explicitly develop the children’s appreciation of the world around them. Examples would include History making use of the Nothe Fort and Rodwell trail, Geography making use of the Jurassic coast and the Apprentice Fair giving pupils in Years 5 and 6 a chance to develop an entrepreneurial spirit. All KS2 pupils learn French and this helps to develop an appreciation of a different culture, including the opportunity for exchange visits. Our school setting gives our children a chance to reflect on a stimulating environment. There is artwork, home learning projects and class work displayed throughout the school. There is a large range of clubs. These include opportunities to stretch the curriculum and children’s creativity into areas such as Lego, choir, table tennis, netball, art for boys and football. Numerous trips develop the students experience of current and past events in history including trips to the Tank Museum to better understand World War II, Scaplan Court for a Victorian experience and a residential stay at New Field Barn enabling the pupils to engage in Viking life. Children from across the school have also had the opportunities to take part in new sports such as Archery, Yoga, Tri-Golf and Rugby. HTP has an award winning garden which annually hosts an NGS Open Weekend raising funds for NGS designated charities. The neighbouring dementia care home has been granted access for its residents to enjoy the garden during non-school hours, weekends and holidays. Our garden is also used as a place of prayer and reflection both for the children and wider school community. The Bereavement Group from Holy Trinity Church meet in our garden for reflection and prayer. HTP sources its hot school meals from a local provider, Weymouth College and has showcased the meals to other schools drawing to their attention the quality of the service and local ingredients used. Our school is a place where staff, Governors and children achieve together. Through regular safeguarding training staff understand how to ensure children remain safe including the dangers of radicalisation and forced marriage. Staff then provide the structure for the best possible range of pupil experiences. Both staff and Governors receive thorough Prevent training which is regularly updated. The children provide gifts for local homeless people at Christmas time; make use of “Breakfast Club” and “After School Club” and read for “Book Club”. Indeed literacy and a love of reading is central to the school, with popular authors such as Chris Connaughton invited to talk to children. 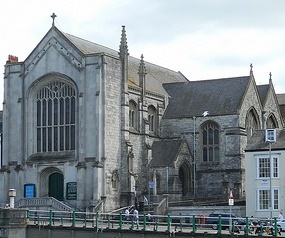 Our school choir sings to the local community at a variety of venues throughout the year at Hope United Reform Church, Holy Trinity Church, St Nicholas Church, Gracewell Residential Home and at the Weymouth Pavilion. The foundation of our life in the Church is worship and prayer, as we support each other on the journey of faith. In the power of God’s spirit we are sent out to make Christ known in the communities he has called us to serve. The National Society Statutory Inspection of Anglican Schools Report can be be downloaded by clicking here. 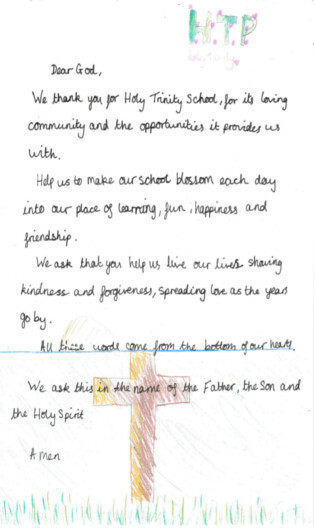 Our School Council worked together with two of our school governors, Mrs Brown and Reverend Franklin, to write our new school prayer. It was read for the first time at Mrs Daykin’s Commissioning Service. Click here to view a larger version of the school prayer.